Rome, November 2016 – In countries across the former Soviet Union, the use of harmful pesticides and the prevalence of obsolete toxic chemicals present significant problems for populations and ecosystems. An EU/FAO co-funded project, between the Rotterdam Convention (RC), PAN UK and non-governmental organizations (NGOs) in six countries has been working to raise awareness in affected areas, with the aim of promoting safer practices. A second target is to bolster national government decision-making processes to reduce the risks among those groups deemed most vulnerable – such as farmers, children, women and seasonal workers. “The dissolution of the Soviet Union has created particular opportunities and challenges for these countries over the last 25 years. One of these is the legacy of large quantities of obsolete stocks; it is estimated that around half the world’s obsolete pesticides are in the former Soviet Union,” said Sheila Willis, Head of International Programmes at the UK’s Pesticide Action Network (PAN UK). “It is also very important that the management of pesticides is strengthened in these countries, as elsewhere, and risks are reduced from the pesticides that are in use today,” she added. A 2015 study published by FAO, PAN UK and partners showed that farming communities in Armenia, Belarus, Georgia, Kyrgyzstan, Moldova, and Ukraine have all reported incidents of acute pesticide poisoning with symptoms ranging from headaches, nausea and rashes through to convulsions, loss of consciousness and even death. In Kyrgyzstan, a pilot survey of farming families in the Chui, Jalal, Abad and Osh regions, revealed that up to 56 percent of women and more than 25 percent of children under 18 interviewed described using pesticides in their work. “While the problem of poisoning of farmers, women and children with pesticides is very urgent, no one is interested,” said Dr. Arslanbop, a doctor working in rural Kyrgyzstan. Both in Kyrgyzstan and Ukraine, more than half of the adults consulted had experienced symptoms of acute pesticide poisoning. The vast majority of those individuals, however, did not consult their national health services or authorities. 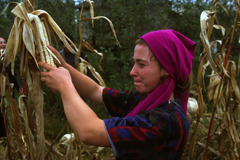 In Moldova, the study focused on teenage children from farming families. Almost 40 percent of these young people said they had used pesticides. Reducing pesticide exposure in children and pregnant women is an important part of the FAO-PAN-UK partnership. The report found that women in each country surveyed, often encountered dangerous chemicals while working in agriculture and, also, while carrying out domestic chores such as washing contaminated clothes by hand. Most do not know how dangerous this is. “Think about the moment a rural farmer identifies a pest destroying their crops, their harvest, or their only source of money. Their immediate reaction is that a pesticide is their best friend,” said Elisabetta Tagliati, FAO Programme Officer for the Rotterdam Convention. While the reliance on pesticides in an ongoing problem, there are often safer options and methods of reducing the risks of using them. Other common practices presenting dangers included not wearing protective equipment when handling pesticides, using food and drink containers for pesticide storage purposes and failing to dispose of chemicals in a safe manner. The burning or discarding of pesticide packaging in fields threatens human health and the environment. Another challenge is that agricultural workers often have poor employment security and little legal protection. They may also lack the relevant language skills to understand pesticide labels and safety instructions. In Georgia, of the Azeri speakers interviewed in the survey, just one percent were able to read the pesticide labels in Georgian. The ex-Soviet bloc makes a substantial contribution to global agricultural output; up to 20 percent of global wheat production comes from these countries. Despite important progress, much remains to be done to ensure future generations in rural areas can prosper. The findings of the studies are helping that push for change by informing the debate among decision-makers, national NGOs and the public. As a result, in Kyrgyzstan, parliamentarians visited affected rural communities to discuss the issues with farming families. In Georgia, an additional study with a focus on vulnerable women, concluded this year. Authorities responded to its findings by tightening legislation on the packing and labelling of pesticide products. They also reported a number of serious incidents involving acutely toxic pesticides that in future may fall under article 6 of the Rotterdam Convention. Strengthening data collection on the use of pesticides and related poisoning incidents at field level helps to inform decision-makers, such as pesticide registrars, enabling them to manage resources more effectively. FAO’s future targets for the region include developing a series of national and regional initiatives to promote a more sustainable approach to food production and to increase the uptake of schemes including Integrated Pest Management (IPM), which emphasises sustainable management of pests and diseases. Download the report of "Supporting evidence-based pesticide regulation and risk reduction in Georgia, with a focus on vulnerable groups". Text by Sarah Barden, Communications Officer, FAO.